It could be for your boss, a colleague or a client. Writing a presentation script for someone else is a specialised task and requires specific steps to make it effective. It is important to understand and clarify your purpose when writing a presentation script for someone else. They may not have the time or the skills required to do it themselves. Clarify if it is a word-for-word script or just key points they require. Some executives are looking for speaking points and do not require a script of every word to be said while other need each word written down. 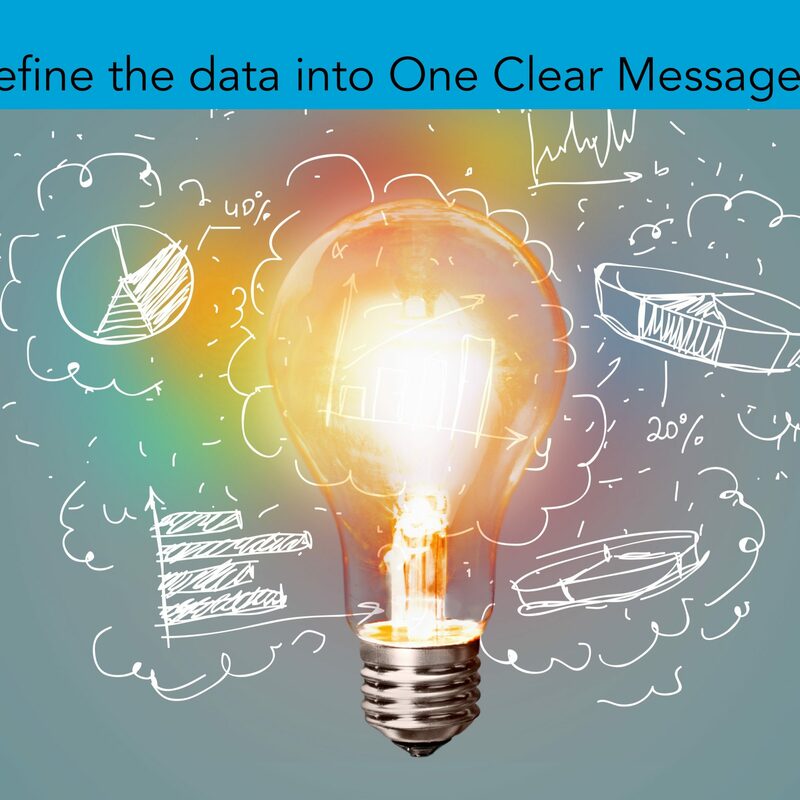 Your job is to help them communicate more clearly and effectively. You do this by helping them with the structure and stories to illustrate their core topic. They may supply these or need more input and research from you. The speaker must approve the speech before presenting it, and should practice it a few times to ensure it works in a way that is natural for them. 1. Get to know the speaker. If you know them well you should have a good idea of their personality, values, and beliefs. If you do not know them well interview them to learn more about the way they see the world. This helps understand their mannerisms and how they share information naturally. Ask some personal questions about what they are passionate about, what makes their eyes light up. 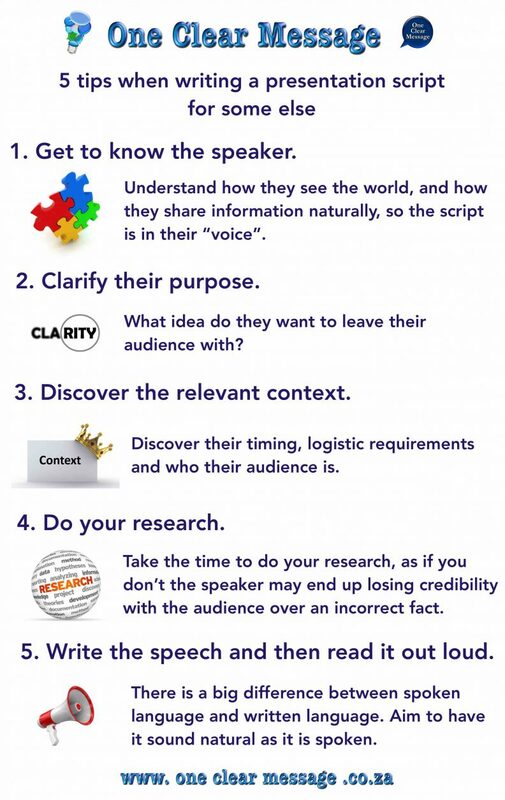 Though much of this information will not end up in the speech it helps you add a more natural passion to their presentation. Listen to them as they talk. Note the types of words or specific phrases they use and where they place the emphasis in sentences when they speak. 2. Clarify their purpose. This provides the core material for the speech. What idea do they want to leave their audience with? It also helps to know their viewpoint and beliefs about the ideas in the presentation. – Why are they speaking? Know what they hope to accomplish. – Understand the core ideas and main points the speaker wants/needs to communicate so you can help make these points clear. – Ask for examples or stories they are willing to share that will help flesh out the main points. The best kinds of stories are personal as they will not have to read them, but a few key words will remind them of their story. 3. Discover the relevant context. Find out how long the presentation needs to be, where it will be given, who the audience is and any other relevant details. – Learn about their audience. Does the speaker have a personal relationship with the group they will be addressing or are they strangers? Identify their roles, backgrounds, values and anything else that will help you tailor the speech to this particular group. Knowing their audience helps identify which stories or examples will have the most impact. – Know the setting. Discover if there will be a microphone, how the stage is set up, lighting, etc. If they are presenting to a small group of colleagues it is different to delivering the same message to a large auditorium full of people. The setting and logistics impacts how fast the speaker can talk, the volume at which they must talk, whether they need to hold a microphone, will have a place for notes, can see the laptop or if they will need a comfort screen. 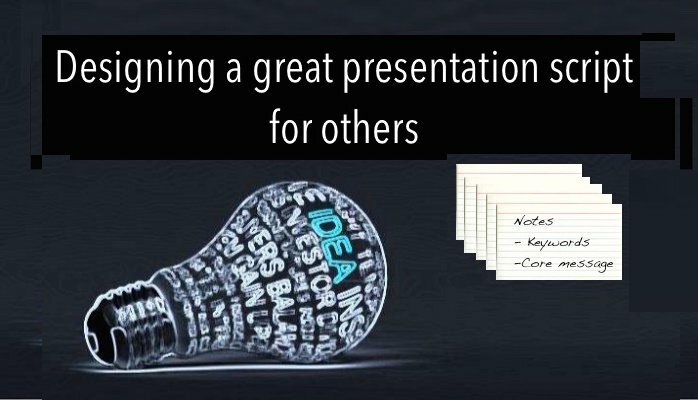 The lighting available impacts the presentation design. Contrast makes your headings more visible. A dark background with light writing is best for a dark room (the writing pops not the screen), while in a light room a light background with dark writing works best. 4. Do your research. For some presentations it is necessary to learn more about the topic. Take the time to do your research, as if you don’t the speaker may end up losing credibility with the audience over an incorrect fact. Even if not all of the research makes it into the presentation it will help you build a solid understanding of concepts. 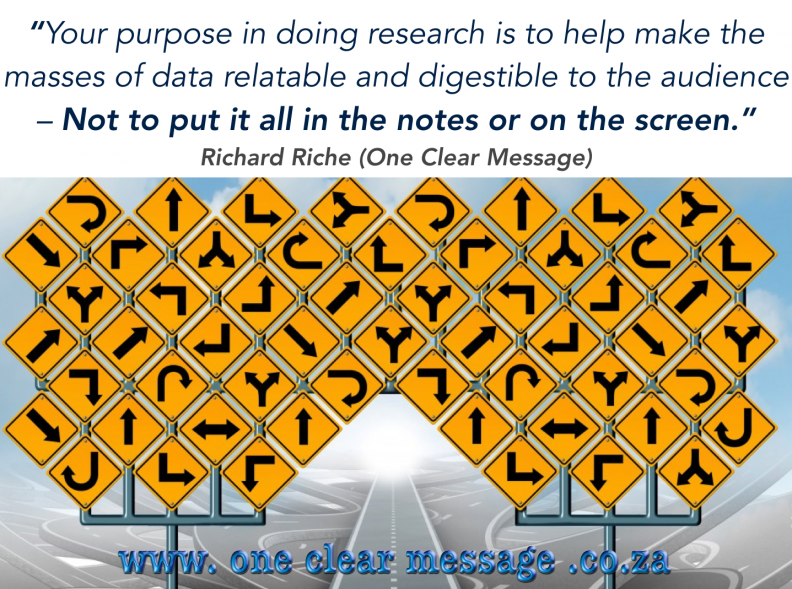 Your purpose in doing research is to help make the masses of data relatable and digestible to the audience – Not to put it all in the notes or on the screen. A valuable approach is to anticipate a variety of audience questions and see if the presentation answers them simply and effectively. If your mother was in the audience would she understand the presentation? If she would understand it then it is probably digestible by the majority of audiences. 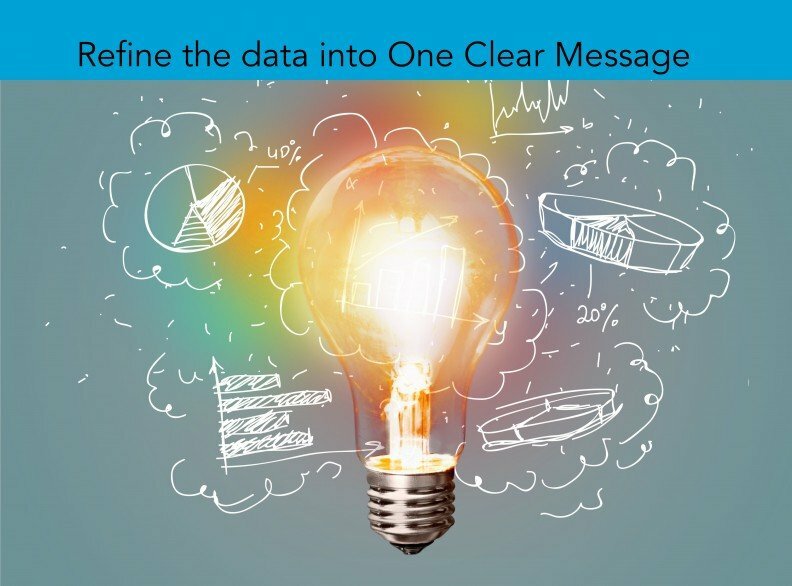 Unless it is a highly specialised audience (i.e all actuaries) then make sure the message is clear to a variety of audience members (Sales, marketing, IT, Admin, etc.). 5. Write the speech and then read it out loud. Practice saying the speech as you write. There is a big difference between spoken language and written language. Aim to have it sound natural as it is spoken. The speech should be memorable and easy to follow. Most importantly, when writing a presentation script for some else, it needs to reflect the speaker’s style, not yours. – Get the audience’s attention quickly with an opening question, statement or by using a story to outline the problem. – Keep the speech clear and easy to follow. Chunking it into bite-sized-chunks and makes it easier to follow. Transitions like “first,” “second,” and “finally” can make it easier for the audience to follow along. The slides should augment this “chucking” approach with one idea per slide rather than a list of boring bullets. Remember to “Think Billboard” when creating your slides. – Use simple short stories or analogies to illustrate facts and concepts. Each slide should have notes to support it. – Keep it short and sweet. Stay well within the time limit the speaker has available and limit the amount of information you include. A rule of thumb is 75% of the time speaking and 25% pausing for the audience to reflect. If you fill the time with talking it can sound rushed and be hard to follow. Audiences need a little time to digest important statements or questions (pause for 3 seconds). It can be useful to put script directions into the document. e.g. /// = 3 second pause (The world has changed /// What worked for our fathers no longer works.) This give the speaker suggestions on pacing when reading the script. – Use repetition and keep a strong focus on the core ideas. – Reflect the person’s speaking style. Mimic their language style, phrasing and emphasis where possible to make it sound more natural. Remember when writing a presentation script for some else to get the speaker’s buy-in. The speaker needs to be on board with what you wrote and how it needs to be delivered. If there is anything they do not agree with, or ideas that are not a natural for them work with them to make it right.